The owner of a light moped (or, according to modern classification — mo-led, i.e. motorbike), equipped with engine D-8, eventually notices that his two-wheeled machine is easy enough starts, sometimes not pulling uphill or bad overcomes the roads. And engine starting by using the Bicycle pedals, on the move, not too easy. However, a moped can be improved. To begin with — footrest. Young “rockers” in the first month of operation remove the circuit veloplivd, leaving the pedals only as footrests and brake. However, this support is very shaky, and to the pedals to brake, have to crank them almost half a turn ago. A way out could be the equipment of a moped with foot pegs of a motorcycle type and a real brake pedal. To do this, remove the entire bottom bracket with the drive sprocket, bottom bracket axle, a ratchet brake lever, by a lever and pedals. Instead, in the same opening in the frame set self-made Assembly consisting of steps (from any mokik or a light motorcycle), welded to the base — segments of pipes with an external diameter of 20 mm. At the free ends of the pipes wwrite nut with thread M8 (left) and the bushing with the hole diameter of 8.5 mm (on the right). On the right Grubu with a diameter of 20 mm slide the sleeve (ogrizek pipe with an inner diameter of 20 mm) is welded thereto the brake pedal, curved from rod with a diameter of 10 mm. To mount a node on a moped is easy. In the hole of the carriage, insert the base of the footrests and connect with a bolt with thread M8. Tighten this bolt will have a screwdriver, so the head of the bolt pre-cut slot of a depth of 2 — 3 mm. That the pedal does not become loose under the bolt head, put the elastic split washer. Some difficulties may cause the connection of the brake pedal with the brake mechanism of the rear wheels. The fact is that regular cable is too short for that and should be replaced by another, more long. Mount it to the brake pedal is easy and, as experience has shown, very reliable: the rope is looped around the brake pedal and clamped a short threaded bolt M8 washer and nut. At the head of the clamping bolt saw a round needle file two grooves — they will not allow the cable to slip out of the clamp. To the point of contact with the pedal the cable was not damaged, he put the piece of sheath from the cable the throttle or brake. To return the pedal to its original position equip its spring-segregateed. Box for the moped. 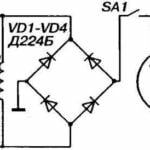 Your engine will easily cope with the road challenges, if you supply a simple transmission. As can be seen from the figure, the box is designed for the type of gear sports bike. But for a moped only requires two stars — two assists for him is enough. Don’t claim what to do and handle such a gearbox is a simple affair. On the contrary, it requires specific mechanical skills, turning, welding. Now — about the box itself. One star on the moped is already there — the regular led that is attached to the rear wheel. Need one with a large number of teeth — about 10 more than on a moped. This can be bought in the shop selling spare parts for bicycles and mopeds. Note that the fit of the sprocket and some children’s bicycles. If you find a ready-made asterisk will fail, do it yourself, first, by calculating its radius. To do this, the step size of the chain (engine chain scooter chain pitch is 12.7 mm) multiply by the number of teeth of the future stars — get the length of the pitch circle. Dividing it by the number 27π=6,2832 get the radius. Pick up dural blank sheet of B4 and draw on it a circle of the calculated radius and then use bench marking of a compass neatly divide by the number of parts equal to the number of teeth. Kern, mark hole centers and drill them with a drill bit the same diameter as that of the roller chain. Trim the workpiece along the circumference of the protrusions of the teeth and apply a file to their tops. 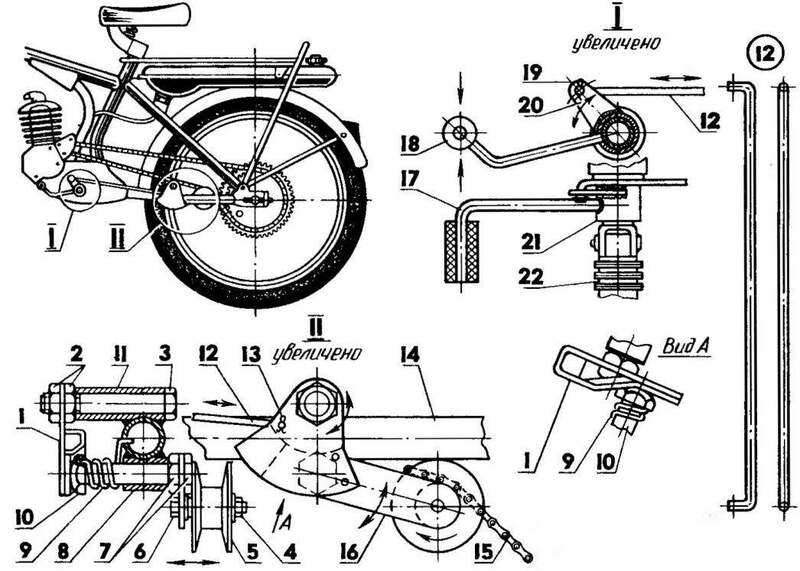 1, 11, 12, 13, 14, 15 —details of foot pegs from a serious moped or light motorbike; 2, 7 — the base of the footrests (steel tube 20×1,5); 3, 8 — thrust ring; 4-M8 nut; 5 — bolt M8; 6 — bushing; 9 — bushing the brake pedal; 10 — brake pedal (steel rod Ø 10); 16 — clip (modified bolt M8 with nut and washer); 17 — rope; 18 — cut braid of the cable; 19 — tube (rubber). 1 — sector of the Cam; 2, 4, 7 — nut; 3,6 — bolts; 5 — a pulley of the caliper; 8 — bushing or INAA; 9 — spring; 10 the axis of the caliper; 11 — sleeve top; 12 — drive rod; 13, 19-pin; 14 — the frame of the moped; 15 — the chain is Bush roller; 16 — the lever of the caliper; 17-pedal; 18 — grommet rubber; 20 — lever; 21 — bushing pedal; 22 — tripping. 1 —the lever of the starting device; 2, 14 — nut; 3, 6 — a washer; 4 — axle bracket shift lever; 5 — the spring return of the operating lever; 7 — a plug-lead and 8 — dog ratchet with a two-pronged; 9 — Carter cap; 10 — engine; 11 — the groove under the ratchet dog; 12 — the screw of fastening of the plug-leash; 13 — pedal lever of the starting device; 15, 18 — screws; 16 — shutdown; 17 — a spring fixing plug-a leash; 19, 20 — Bush; 21 — a gear wheel of the engine. Fasten the sprocket on the rear wheel so much was at the wheel hub. Next — gear. How it works, it is clear from the figure. Peru the left bottom fork of the rear wheel of a moped welded two sleeves. In the lower fixed caliper — spring-loaded lever at the end of which is a small pulley. 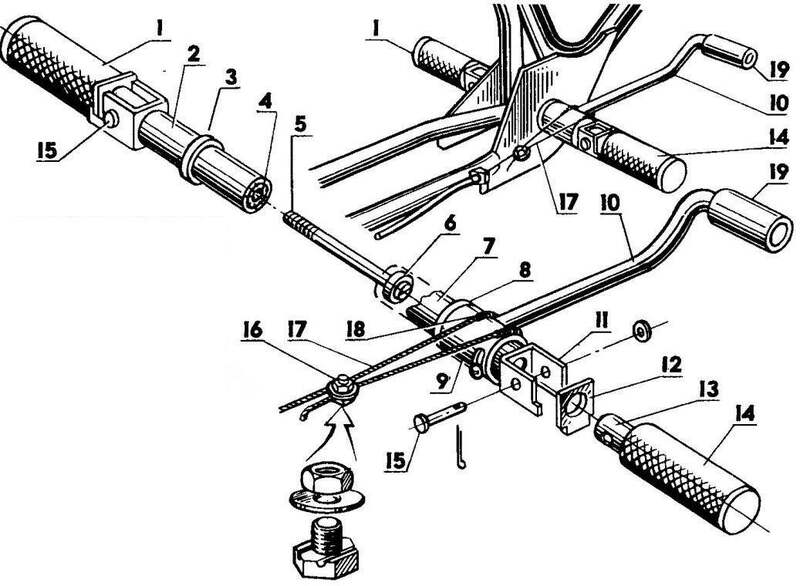 The lever can move in the sleeve to the right and to the left, transferring the chain from one sprocket to another, and a spring constantly keeps the chain taut. At the top the hub is mounted a Cam sector: it moves, it presses the caliper thereby moving the chain from a small sprocket to a larger one. When the sector moves in the opposite direction, the spring presses the caliper in position and the circuit is thus transferred to the small sprocket. And finally, the pedal shifter. It is a sleeve welded to it with a foot pad and a lever. Thrust of thick wire lever connected with the Cam sector. Thus, when the pedal chain is on the big sprocket turns on the first transmission. If the toe of the Shoe to hook on the pedal and brought it up, the chain will spread to the regular sprocket, and turn on the second transmission. Kik for moped. Do you know what is the difference between mopeds and mokiki? 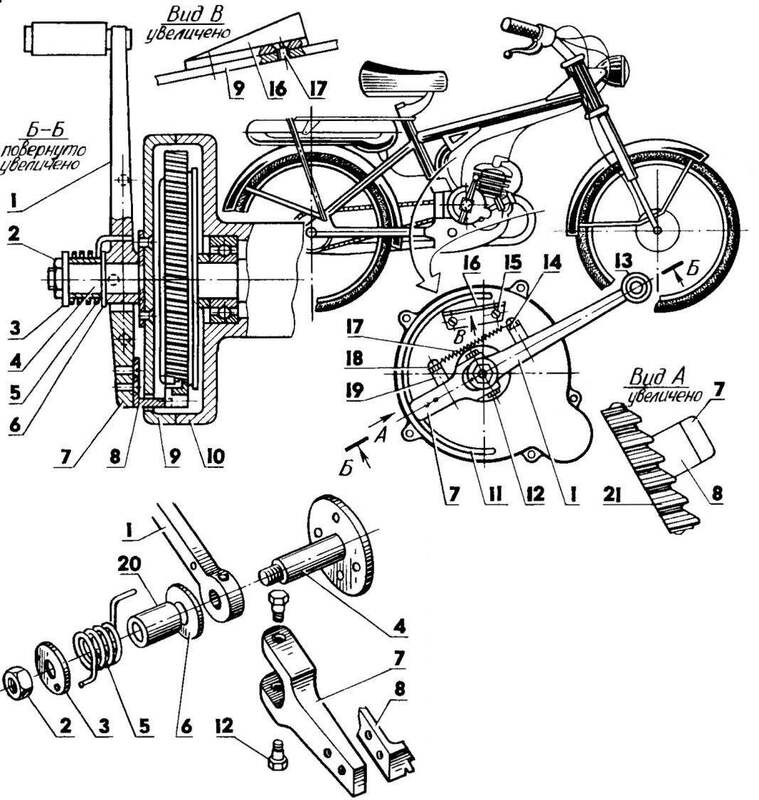 A moped is a motor plus pedals, and mokik — motor plus kick-starter. Of course, to start the engine starting device easier and more convenient than pedals. To begin with we will understand the device of the kickstarter. If you remove the engine crankcase, D-8, right cover, then under it will be found a large gear meshing with a small gear on the crankshaft. This wheel and will be the basis of the starting device is Cut on its side of the inclined teeth, thereby transforming into a kind of ratchet. The depth of each tooth 2 — 2.5 mm step — in two or three teeth of the wheel. By the way, focusing on them accurately enough to withstand the distance between the teeth of the ratchet. Modify and cover case. It penetrate, the groove width of about 5 mm (the form shown in figure) and secure with screws axle bracket for installation of the lever of the starting device. 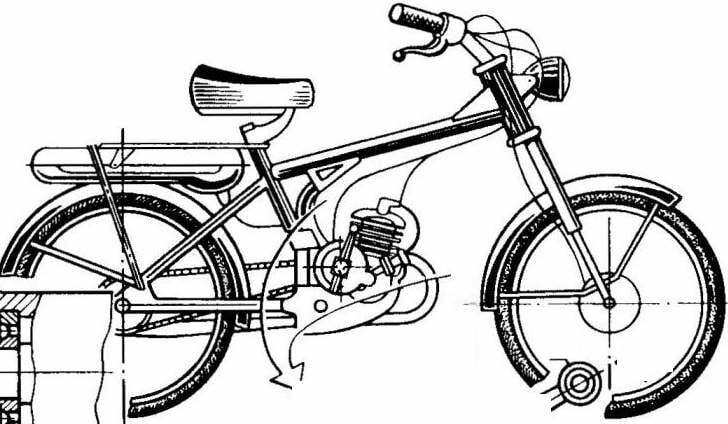 The lever of the starting device is better to use ready — veloplivd moped or any Bicycle. Revision of it boils down to trimming the pedal axis to a size of 70 mm, and then pull the axle cut the rubber hose. In the mechanism of starting device used two springs. One located on the axis of the kick lever and the torsion, is used for its return. The second connecting lever and the fork-leash work in tension and are designed to hold a leash in two positions: pressed to the ratchet wheel and is pressed from it. And one more important detail — cutter, cast at the end of the working stroke of the leash from the ratchet wheel. Without it, running can lead to damage to the engine – this thing will crash into the crankcase cover. To avoid this, fasten on the cover of the Carter dural area with sloping shelf. Getting on it at the end of the stroke, the leash is lifted and disengaged from the ratchet. Now try to start the motor. Turn the clutch by putting the lever on the latch with a toe drag the leash in a position where the pawl will engage ratchet wheel, and press on the pedal.